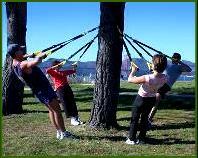 Beyond the Gym’s ‘Boot Camp’ will feature TRX Suspension Training! You make the choice… Beyond the Gym’s boot camp class is limited to 8 participants and will take place in beautiful park (not parking lot!) settings to help energize and recharge your mind & your body! What are you waiting for?? Sign up NOW! Next Evening session starts in June at Triunfo Park in Westlake! This will be a twice weekly, 4 or 6 week program with a maximum enrollment of 8 people in each camp. Our next boot camp starts in June, so sign up early to reserve your spot! Do something good for yourself...you deserve it! Get in great shape and have a great time with this fun and challenging new class!! · Small Class Size! Our classes are limited to 8 people, ensuring that you’ll get plenty of attention to perfect your form- maximizing your exercise benefits and minimizing your chance of injury. · Fun Variety of Workout Equipment! Sure, we perform many exercises using body weight, but we’ll also incorporate lots of fun training tools like agility ladders, BOSU balance trainers, TRX Suspension Training, kettle bells, medicine balls, Pilates rings… You never know what might be next! · Interesting Locations! 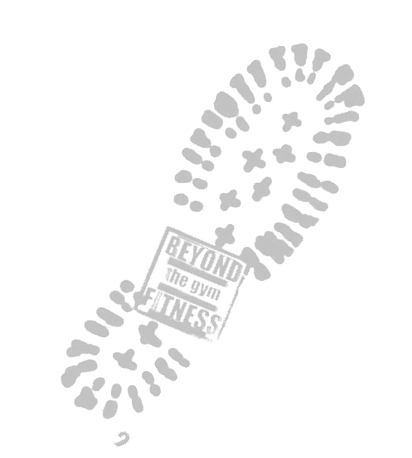 Beyond the Gym’s classes will take place in beautiful settings that each offer new and interesting training options like trail climbs, sand volleyball courts and stair runs.